China’s first official economic gauge for March signaled a stabilization in the world’s second-largest economy, easing one of the biggest worries for the global outlook. The manufacturing purchasing managers index rose to 50.5 from 49.2 last month, the biggest increase since 2012 and exceeding all estimates by economists. 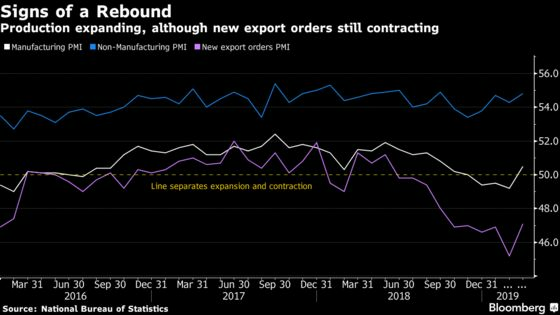 Both new orders and new export orders – leading sub-gauges that signal future activities -- rose to the highest levels in six months. The private Caixin manufacturing PMI, which better reflects sentiment among smaller and private firms, also returned to expansionary territory for the first time in four months, according to data released Monday. That’s good news for global investors, as China’s weakening demand had weighed on sectors such as auto producers and commodity exporters worldwide. However, with tariffs and uncertainty about whether a deal with the U.S. will be signed weighing on trade and no sign of a rebound in domestic consumption yet, there is still a way to go. “China’s economy has improved, supporting a stabilization in the global economy,” said Hua Changchun, global chief economist at Guotai Junan Securities Co. That stabilization will also lift the European and U.S. economies, and may lead to a global asset price increase, he said. Sunday’s release backs up signs of recovery seen in the earliest data on the economy, which showed business confidence and stock markets improving amid policy support and progress in the China-U.S. trade talks. 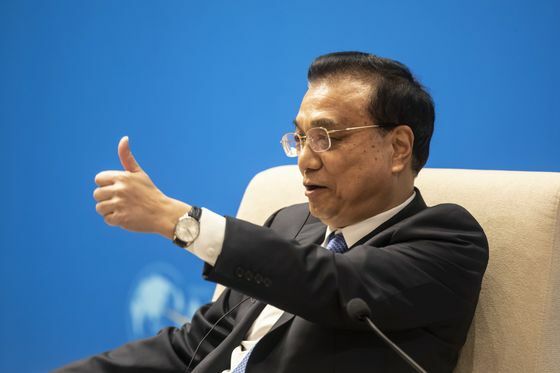 The government is also showing signs of optimism, with Premier Li Keqiang last week telling business people that the economy is doing better in the first quarter than expected. Still, there’s evidence for caution. New export orders are still contracting even after the pickup from the lowest level in a decade in February. In addition, the rise in the March data may overstate the actual increase in activity, as the Lunar New Year holiday in February weighed down the data then, according to Zhou Hao, an economist with Commerzbank AG in Singapore. The official manufacturing PMI has never dropped in March since it was introduced in 2005, and the pickup this year “isn’t particularly big,” comparing with the average rebound in the past decade, Larry Hu, head of China Economics at Macquarie Securities Ltd. in Hong Kong, wrote in a note. Growth of the world’s second-largest economy will slow further in the first quarter to 6.2 percent from a year earlier and stabilize at that level throughout 2019, according to economists surveyed by Bloomberg. The government has repeatedly vowed not to resort to “flood-like” stimulus and may pare back support measures if things do start looking better. “Once the rebound is confirmed, the government will not use up their fiscal firepower,” according to Ding Shuang, chief China and North Asia economist at Standard Chartered Bank Ltd. in Hong Kong. According to Ding, the government is still concerned about local government debt risks, and if the trade talks reach a deal there will likely be a reduction in policy stimulus around mid-year.